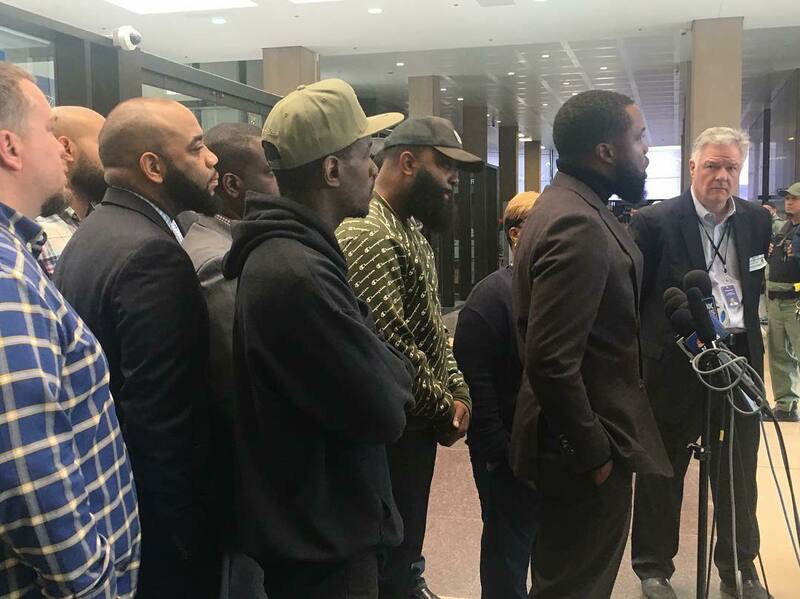 Lamar Simms (tan hat) looks on with a group of Chicago faith leaders as Pastor Charlie Dates addresses the press on the week the verdict was read. Lamar Simms is the Director of High School Programs at Sunshine. He is also a pastor with Legacy Church in Chicago, a spoken word artist, a photographer, a husband, and a father of four. Lamar has in-depth experience with the LaQuan McDonald case and sat down to share some of his thoughts, feelings, and opinions with us. If you aren’t familiar with the LaQuan McDonald case, you can read about it here. Holly: Tell me your first memory of hearing about Laquan McDonald? Lamar: I heard about LaQuan McDonald when the tapes [of him being shot] were first released in the media. As the days and weeks progressed and more information became available about the cover-up from the Police Department and even the Mayor’s office, I felt more and more angry. I joined with some of the protests that were happening in Chicago to channel my anger. Holly: How did you first get involved with activism? Lamar: The first protest I attended was prior to LaQuan McDonald. It was the year before when Michael Brown was killed in Ferguson. I was working in downtown Chicago and when I got off work in the evening, some of the marchers were coming right by my work. I started marching with them and to this day it is one of the most powerful experiences of my life. For the first time, I felt the anger and deep pain I had felt watching my community, my people being murdered, could be channeled into solidarity. I’ve never felt so connected to my people and our pain. I felt like I was in a time machine. I felt like Martin and Malcolm and Mandela were with me. Holly: So after that first experience, did you stay connected to the activists? Lamar: Yes, the activists I first marched with were the Black Lives Matter Chicago chapter. I continued to stay connected to their efforts to bring awareness to police brutality towards black and brown people. My church was also involved in protesting and the more I became involved, the more it became a passion to not just bring awareness, but also bring about change politically. Holly: So when the news reported about LaQuan McDonald, you were already involved? Lamar: Yes, LaQuan McDonald just brought it closer to home because he was from Chicago. I didn’t know him, but felt very connected to him from the beginning. He could have been me, or one of my brothers, or one of the teens I work with. Holly: Leading up to the trial of Jason Van Dyke, how were you involved in activism? Lamar: Yes, I befriended William Calloway, who was one of the leaders of the movement to bring awareness and change policies around police violence. He is a community activist and I would often join with him when they were doing marches, rallies, protests, or petitions. Holly: There are some who critique the method of protesting, rallies, marches, etc. and the Black Lives Matter movement. What would you say to them? Lamar: When you grow up in a context where you see injustice for your fellow brothers and sisters happening on a daily basis – from unequipped schools, to police brutality, to lack of jobs – it tears you down. I often feel so discouraged, like there’s no reason to keep fighting for justice when it never comes. Being a part of activism in Chicago has been a way to channel my feelings into something that gives me hope. Solidarity with others who feel the same way is so empowering. I also feel so strongly as a follower of Christ that we can’t be quiet about the things that God is loud about in scripture. He speaks over and over about injustice and so we have to also speak about it and fight for it when we see it happening. Holly: I’m sure because of the personal connection you had in this case the week leading up to the verdict of the officer, Jason Van Dyke, was emotional? Lamar: I felt like I was on trial. Like I was waiting to see if I got murdered, would I get justice? Would people care? Or would it be another white man getting away with it? Holly: Was the community on edge? Lamar: Yes, the general feeling in Chicago seemed to be anxious. I know some were talking about rioting if Van Dyke was acquitted. I just didn’t know what would happen. Holly: Tell me about your experience when you heard the final verdict. Lamar: Well, the week leading up to it, I actually attended one of the court hearings. I sat across the room from Van Dyke. But the morning of, I was at Sunshine for an all-staff meeting. Honestly, it was so hard to concentrate on anything else. I couldn’t eat or sleep the entire week. We all prayed together beforehand and once we heard that he was charged with Second Degree Murder, I felt a huge sigh of relief. Afterward, I attended a rally downtown that William Calloway asked me to come to with some other pastors. Holly: Tell me about the rally that day. Lamar: It felt bigger than LaQuan. LaQuan represented me. He represented the black population in Chicago. How the jury viewed him is how they view us. It gave us hope. God gave us justice on that day to give us hope to keep fighting. It was emotional and validating to join with activists and pastors to celebrate that justice had come for us.